New RAC Book By Mr.Syed Jaffar Hussain and Others. RAC or Real Application Clusters is a grid computing solution that allows multiple nodes (servers) in a clustered system to mount and open a single database that resides on shared disk storage. Should a single system (node) fail, the database service will still be available on the remaining nodes. RAC is an integral part of the Oracle database setup: one database, multiple users accessing it, in real time. This book will enable DBAs to get their finger on the pulse of the Oracle 11g RAC environment quickly and easily. 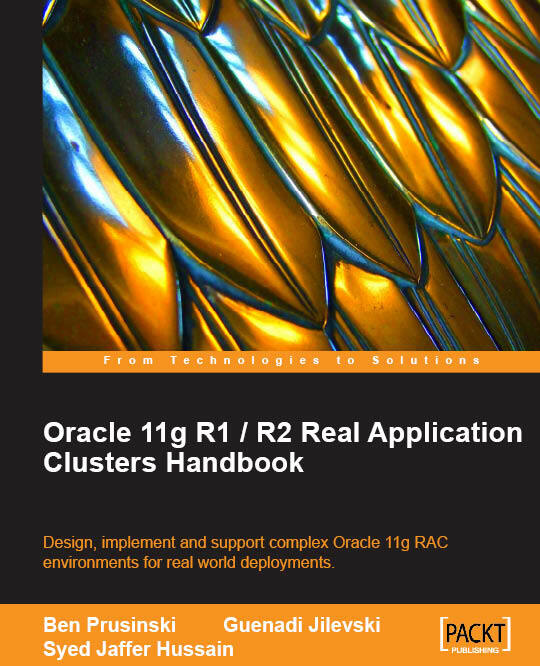 This practical handbook documents how to administer a complex Oracle 11g RAC environment. It covers all areas of the Oracle 11g R1 RAC environment, with bonus R2 information included, and is indispensable if you are an Oracle DBA charged with configuring and implementing Oracle11g. It presents a complete method for the design, installation, and configuration of Oracle 11g RAC, ultimately enabling rapid administration of Oracle 11g RAC environments. Packed with real-world examples, expert tips, and troubleshooting advice, the book begins by introducing the concept of RAC and High Availability. It then dives deep into the world of RAC design, installation, and configuration, enabling you to support complex RAC environments for real-world deployments. Chapters cover RAC and High Availability, Oracle 11g RAC Architecture, Oracle 11g RAC Installation, Automatic Storage Management, Troubleshooting, Workload Management, and much more. By following the practical examples in the book, you will learn every concept of the RAC environment and how to successfully support complex Oracle 11g R1 and R2 RAC environments for various deployments in real-world situations. Effectively manage the complex 11g Clusterware, using key troubleshooting tips and techniques. Please send me the link to download. Thanks. Do you have a copy of this book?